This is the moment a tattoo artist had his face tattoo removed in the most excruciating way possible, by tearing his skin off. The tattoo artist, known only as Josh, had the words ‘Freedom’ and ‘Overcome’ (great words…) tattooed on his forehead, reports The Sun. 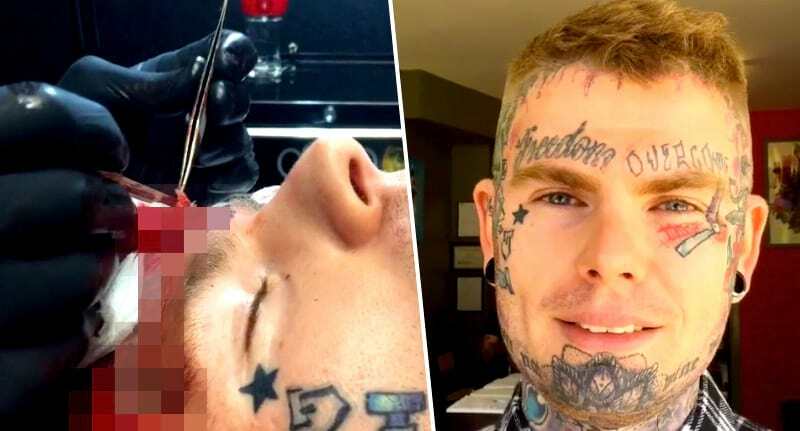 Probably as a result of having a terrible tattoo on his face, Josh decided he wanted a change – so he went to Bslice who took chunks out of his head to make a pattern. Thankfully the whole thing was captured on video and posted for all the world to see as Bslice hacks away at Josh’s face, revealing the raw bloody flesh underneath. Essentially what Josh was undergoing was a process known as scarification which involves removing a layer of skin and flesh with a scalpel in the shape of your desired design. When the area heals over, the scar becomes almost like a very elaborate tattoo.